We have a welcoming ground floor, 723 sq. ft. one bedroom condiminium at the Kihei Kai Nani complex across the street from a beautiful beach, Kamaole II, in Kihei (240 paces to sand). Kamaole II is a beautiful golden sand beach (rated as one of the 15 best beaches on Maui by the well respected Maui Revealed), which is both long and wide and has a nice snorkeling reef at its end. It has a lifeguard during the day and is shallow, making it family friendly. A short walk away are Kamaole I and III and a well maintained pathway is available for walkers and joggers that will take you from one beach to another all the way down to beautiful and exclusive Wailea (a relaxing 2 mile shoreline walk). There are benches situatated along this pathway to allow for resting and Whale Watching during the December - March timeframe, when the Whales are frequently seen frolicking just off shore. The unit is fully furnished for you to enjoy your vacation in Maui. It has an ideal location in the complex with a garden view, giving it the advantage of privacy, so that you can sit quietly on the lanai and enjoy breakfast or read a book or simply enjoy hearing the birds. It is also steps away from the large freshwater pool and the main office and laundry facilities. The staff at Kihei Kai Nani is very helpful and will assist with informational needs. Recent updates include kitchen & tiled countertops, new bathroom with shower stall, newer tiled flooring and new carpeting. It has a TV/DVD/Radio in the Living room as well as a TV in the bedroom. Cable TV, free wireless internet is included and number of books and movies are also available for your enjoyment. An outdoor BBQ is feet way from the Lanai, and some beach play equipment is provided. Calendar, showing up to date availability, can be seen at our website at the link provided in the listing below the Rate Details section and the Contact Owner button. NOTE: Even if our condo is booked, we can refer you to other condo owners at the Kihei Kai Nani complex, so please inquire about your desired dates. Discounted Pricing for stays of 4 or more weeks! See Rates below. We are a family of three, who fell in love with Maui when visiting from Michigan. The lovely mild weather and friendly people of Maui make every day here seem magical. The snorkeling here is excellent and so is the dining. There are ample of opportunities to enjoy pristine natural beauty, from one of the highest mountains anywhere, to double rainbows, to turtles popping out their heads to nibble on growth on rocks by the shore. You will love Maui too. Use our place to relax and enjoy! Kihei Kai Nani has an outstanding location, directly accross from Kamaole II beach, rated one of the top 10 beaches on Maui by the well-respected Maui Revealed travel guide. The beach has lovely golden sand and is both wide and long with a good snorkeling reef at its end. If you walk 3 minutes, you are on Kamaole III, another very long, beautiful beach! Both beaches have lifeguards during daytime and are nice and shallow for families. If you are a walker or jogger, there is a pathway connecting the beaches from Kamaole II all the way do Wailea (2 miles one way). What a lovely and exhilirating walk! From Kihei Kai Nani, you are able to stay in a comfortable unit at an affordable price, be minues from a lovely beach and steps from a great pool, while being minutes drive or walk away from ritzy Wailea, the best of both worlds! Our unit (125) at Kihei Kai Nani, is on the ground floor. Its location gives it many advantages, the primary one being privacy and quiet. The lanai backs up to a garden view. There are no buildings facing you, which affords you maximum privacy and hours of peaceful relaxation on the lanai. Additionally, it is 30 paces from the great freshwater pool and the office and laundry facility. Longer Stays (4 or more weeks) qualify for discounted pricing! See Rates section. 1 newly remodeled tiled bathroom with shower stall. The Kihei Kai Nani condo property is literally across the street from Kamaole II beach, which is between Kamaole 1 & III beaches. All the Kamaole beaches are rated among the top 10 beaches on Maui. Washing Machine is not in the condo, but in the next door building which houses the condo offices and coin operated laundromat and pool. Dryer is not in the condo, but in the next door building which houses the condo offices and coin operated laundromat and pool. Parking for one vehicle per condo allowed free. 4 bath and beach towels are provided. Snorkel equipment and beach chairs & umbrella. Small lawn area behind condo lanai. Lanai in the back faces a quiet garden area. This Condo was like home away from home!!! It was clean and cozy and reminded us of a cabin. The washroom was newly renovated and the bed was so comfortable. Great air conditioning and so many amenities. It had everything we could ask for.... beach chairs, paddle boards, snorkel gear, games, movies, stocked kitchen and also fresh condiments in the fridge. We loved the little pool area but the best part was it is located right across from a beautiful beach. Just minutes away from the famous Maui sunset over the ocean!!!! We will definitely be back and next time with the family. Lisa and Chuck are wonderful hosts and popped by to check on us! Thank you for everything!!!!! Thank you for your wonderful review Angela. We are delighted that you enjoyed staying in condo 125 at the Kihei Kai Nani resort on your recent visit to Maui and that we could help make your Maui vacation comfortable and memorable. We look forward to hosting you again on future Maui visits. Two thumbs up for this unit. We had a great time staying in this unit. Very good location to everything we wanted to do. Clean and comfortable. Nice pool. We would definitely stay in this unit again. Great location. The condo is comfortable and nicely furnished. We enjoyed the central location within reasonable walking distance of beach, shops and restaurants. There was some road noise throughout the night but it was buffered by a few buildings and the vegetation. Grounds are nicely maintained. Hospitable, friendly people. Thank you Elenor for choose our condo 125 at the Kihei Kai Nani resort for your Maui accommodations. Thank you as well for your kind review. I also want to take the opportunity to thank you for leaving the condo so neat and clean upon departure. We hope to host you again the next time you visit Maui!! Thank you very much for letting us rent your condo!! We absolutely loved it, the location behind the office was great, super quiet, just steps to the pool and laundry. The condo was clean and cool, the bed was very comfortable. We had a few issues with the tv in the living room, we think the cord might be going but apart from that it was wonderful. It was very hard to leave and we will definitely be back. Thank you!! Thank you Kelli for your lovely review. We are glad you enjoyed your stay in our condo 125 at the Kihei Kai Nai Resort. We are sorry about your problems with the TV. There was new cable installed and the complex and the cable box needed to be changed out. It works fine now. Thank you for letting us know about the problem & for your patience. We look forward to hosting you again. Thank you for choosing our condo #125 at Kihei Kai Nani for your holiday accommodations. We were glad to host you and hope to host you again on future Maui visits. We have stayed on Maui many times. We have stayed in a variety of other condos and local luxury hotels. Our experience at Kihei Kai Nani 125 was exceptionally good. The price was more than reasonable, the location was superb. The condo had evertything we could possibly need. The kitchen and bathroom look like they have been recently updated! We celebrated our 30 year wedding anniversary. We booked our stay rather spontaneously on short notice. We were accommodated quickly and friendly. Our stay was so perfect, we will be back soon! The Condo is in Kihei Kai Nani is across the street from Kamaole Beach II, which is rated as one of the top beaches on Maui by many publications, including the highly regarded Maui Revealed. It is within walking distance of several good restaurants, shops and snorkeling, making it possible to vacation here without renting a car. Maui buses stop just outside Kihei Kai Nani, and have several routes. Further, it is located 2 miles from exclusive Wailea with wonderful golf courses, beaches, snorkeling and shopping. 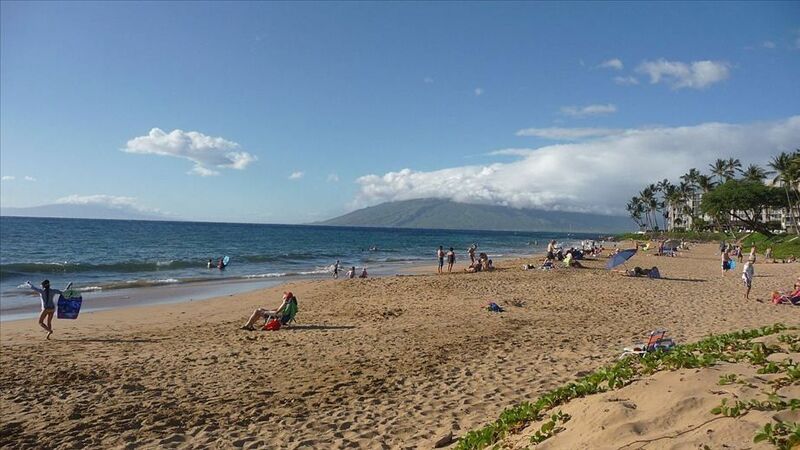 Kamaole Beach II has wonderful golden sand, is both wide and long and has good snorkeling on the North and South ends. Further, a walking path runs along the coastline and beaches connecting Kamaole Beach I, all the way South to Makena beach, making for wonderful shoreline walks or jogging. There are benches situated along this pathway to allow for resting and Whale Watching during the December - March, when the Whales are frequently seen frolicking just off-shore. Fitness Center, massage Therapist & other services are not on the Kihei Kai Nani resort but a short 1 - 2 mile drive away in the town of Kihei. Check in 3:00 pm / Check out 11:00 am. Condo quiet time observed past 10pm. A non-refundable $300 deposit is required to hold this time period on our calendar ($600 for stays of 4 or more weeks). Deposit is applied towards the total condo booking cost. Full payment is due 45 prior to arrival (60 days for December bookings). Credit Card info is retained on file in lieu of a security deposit.